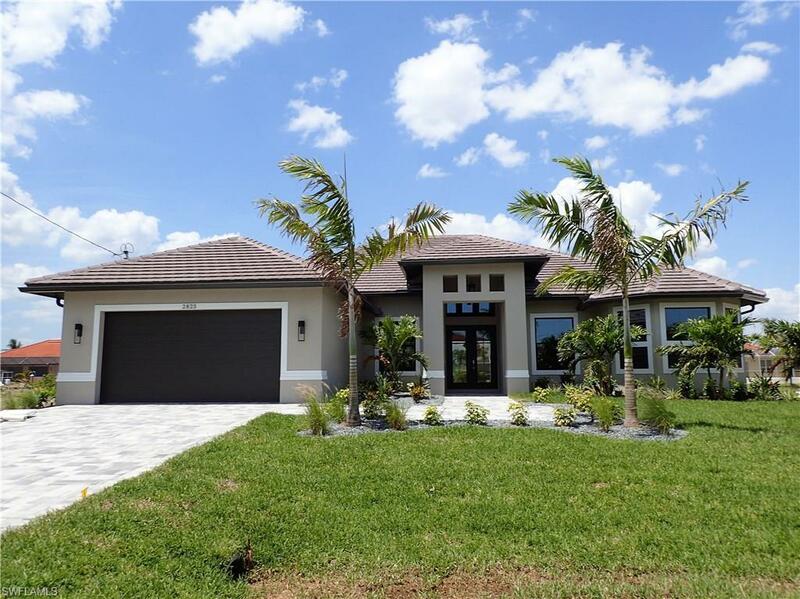 Florida Premier Real Estate Group, Inc.
**BRAND NEW GULF ACCESS POOL HOME, READY NOW! Located off Surfside Blvd. with one bridge to the Gulf of Mexico! This lovely pool home has attached spa with open design living area including a den, 3 bedrooms, 3 full bathrooms, a family room w/wet bar, dining room, utility room & living area over looking the generous lanai. Water views from all living areas & the master bedroom. Attention to detail will set this home apart from the rest: coffered ceilings, 6" base through out, Jacuzzi jet tub in master bath, plus much more. Other features: plank tile flooring, granite counter tops, under cabinet lighting, stainless kitchen appliances, 42" upper cabinets, soft close hinges on cabinets and drawers, security system, carpet in bedrooms, upgraded landscaping with floratam sod & irrigation system. This home has low E insulated IMPACT WINDOWS & SLIDERS, tile roof with off ridge vents, city utilities in place and finished with paver driveway, walkway and lanai. This fantastic floor plan allows for great entertaining or quiet time, whatever your mood!! © 2019 Cape Coral Assoc. of Realtors All rights reserved. Information deemed to be reliable but not guaranteed. The data relating to real estate for sale on this website comes in part from the Broker Reciprocitysm Program. Real estate listings held by brokerage firms other than Florida Premier Real Estate Group are marked with the BR logo and detailed information about them includes the name of the listing brokers. Listing broker has attempted to offer accurate data, but buyers are advised to confirm all items. Information last updated on 2018-05-17.